We have great news for Missouri’s dogs! Voters in Liberty, Missouri, made history yesterday when they hit the polls in full force to cast their votes in favor of repealing the city’s pit bull ban. The ballot question overturned the city’s current ordinance that barred city residents from adopting new pit bull dogs. Until this vote, the ban was in effect for over 30 years. 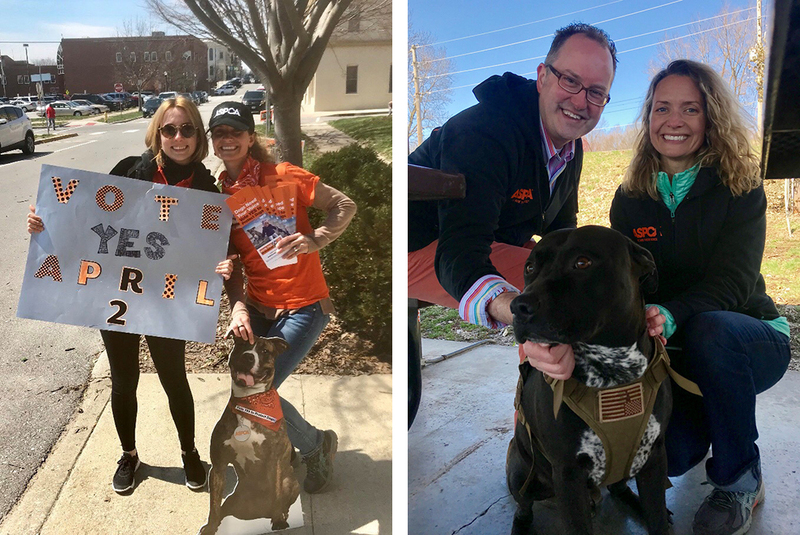 Working in partnership with the Liberty Pit bull Alliance, the ASPCA led a team of local volunteers in a strong ground effort to mobilize support for the question to protect dogs. For weeks these advocates took to the streets, braving snow squalls and fierce thunderstorms, in order to let Liberty voters know why voting “yes” on this question was important for the safety and well-being of their community. Breed-specific legislation (BSL) is the blanket term for laws that either regulate or ban certain dog breeds in an effort to decrease dog attacks on humans and other animals. While many municipalities have passed these laws, there is no evidence that they make communities safer for people or companion animals. In fact, they often compromise public safety. Between 2005 and 2015, when Florissant, Missouri, enacted its breed-specific ban, the city reported dog bites doubled despite a decline in the city’s population. Breed-specific laws shift focus away from the effective enforcement of laws that have the best chances of making communities safer. Responsible owners of entirely friendly, properly supervised and well-socialized dogs should not be penalized simply because their dog happens to resemble a specific breed. The victory in Liberty is part of a growing trend and comes on the heels of BSL-repeal victories in neighboring Springfield and Yakima, Washington, last year. We applaud the voters of Liberty for taking a stand against this misguided law, and we thank all our local advocates who made their voices heard for dogs and their families. Check out the photos below to see our Liberty team in action! Then, if you haven't yet, be sure to join the ASPCA’s Advocacy Brigade to stay up-to-date on animal-related issues and receive special alerts when dogs and other furry friends in your state and community need your help.